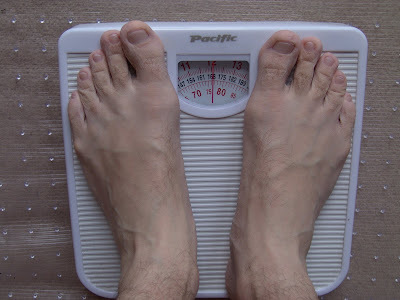 Weighty Matters: Repost: Do you have Scale Addiction? It's certainly not a condition written about in medical textbooks. I'm talking about scale addiction. An affliction that causes the sufferer, usually someone in the midst of a weight loss effort, to step on the scale multiple times a day whereupon if the scale does not go down or goes up, they suffer mild to severe mental anguish. I've met many folks who are scale addicts. They tell me that rationally they understand that getting on the scale multiple times a day won't make a difference, but that they just can't help themselves. For those folks I usually offer to babysit their scales in my office or I recommend that they turn them over, take out the batteries or put tape on the solar strip. The thing is scales are truly frustrating devices because they don't simply measure caloric intake vs. caloric expenditure. They measure clothing, water retention, constipation and time of day differences. Firstly, there's 3,500 calories in a pound, and while bodies are not mathematical instruments whereby if you do or don't eat 3,500 calories you'll see a pound change on the scale, bodies do obey the laws of thermodynamics and if you step on a scale on a Wednesday and it's 3 pounds heavier than Tuesday, unless you consumed at least 10,500 calories more than you burned, the scale is weighing something other than true weight. Secondly, your weight doesn't matter. What do I mean by that? To put it simply, what moves the number on the scale is not the act of standing on the scale, it's what you're doing and choosing during the times you're not standing on the scale. It's your lifestyle and your choices that change your weight. You need to determine how you're doing by how you're doing. What have your dietary choices been like? How's your fitness? Are you being thoughtful? Are you organized and consistent? Scales can be helpful to illustrate trends, but weight fluctuation, both inter and intra day fluctuations are normal. At the end of the day, it's your life that can change the scale, not the other way around. My recommendations? During a weight loss effort weigh yourself once a week, stark naked Wednesday morning before breakfast. During a weight maintenance effort weigh yourself daily and get to learn your body's weight fluctuations and more importantly, use the scale to nip any weight regain in the bud. Break the habit, stop the weighing.